My name is Will Perez. I have been the Physical Education Director at the Victory Center for over two years. The kids at school refer to me as "Coach." As you probably already know, the Victory Center is a school that provides a variety of services for children with Autism and behavioral challenges. 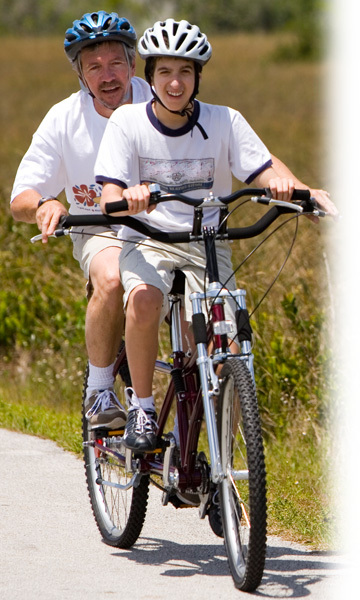 What you probably do not know is that the Buddy Bike has done wonders for our children. As a P.E. teacher, my main concern has always been to improve the quality of life of my students, primarily through fun gross motor activities. We have a variety of bicycles at school (from small bicycles with training wheels, to 20 inch bikes with support bars, to 26 inch mountain bikes, to the famous Buddy Bike. The majority of our children ride with training wheels or a support bar (but require moderate to maximum physical assistance from myself or the coaching staff) to balance the bike while he/she rides. All of them really enjoy learning to ride but none of them actually experience what it is like to ride at a good pace or what it feels like to have the wind blow in their face while riding through nature's outdoors. The Buddy Bike has given them that! With either myself or a coaching staff in the back seat of "that extraordinary 2 person bike," each child (from the Victory Center) can ride bicycle like everyone else. Aside from the physical benefits they receive i.e. lower body/core strength, stability and coordination, it has given them a sense of belonging and has driven them to "want to attend physical education and "ride with coach." The look on their faces is one that I cannot describe. Two children in the school can now ride a 20 inch bike independently because the Buddy Bike has allowed them to develop the "Mechanics" necessary to perform the task of riding a bike. The buddy bike is the most magnificent gross motor training tool that I have ever used in my 13 years of working with children with disabilities. I truly love it. My coaching staff loves it and the students of the Victory Center rely on it so that one day, they can ride independently. Thank you and everyone else who made it possible for the Buddy Bike to be a part of the lives of the children of the Victory Center. Thank you very much.